In April 2012, the one that got away didn’t get away. Using Fishbites E-Z Clam strip baits, Local surf caster Manuel Briceno landed what turned out to be the world’s largest Pompano, landed on the shores of South Fl. Fishbites goes “Behind the Reel” to hear to hear the full story of the Venezuelan born Horse trainer – turned “King of the beach” Pompano fisherman, Manuel Briceno, Vero Beach FL. Manuel was born in Venezuela and didn’t go fishing much as a child. His father had large fishing boats and it was more like work than pleasure to Manuel. “The smell of the fuel and all of the blood just wasn’t for me” he said. It wasn’t until after finishing college in South Florida that Manuel began to learn to fish. Local surf casters taught him to read the tides, white caps, sun placement and ultimately turned him on to Fishbites EZ Clam Strips scented bait. One afternoon, enjoying the scenery and sunset, he had a hit like no other. He had two lines out, one using fresh sand flea, the other Fishbites. The rod with the Fishbites took off and bent over as if he had a large shark on. “It went side to side. At first I thought it was a shark, but the sharks typically show themselves by jumping or showing off their fins. This fish kept running hard side to side. I kept pressure on it, constantly reeling and backing up on the beach, hoping I wouldn’t lose it. I knew it was a monster!” It appeared! “I saw him swim sideways through the wave. With the sun shining down on it, it almost glowed. It was a big deal, it really changed my life”. Manuel, now completely hooked himself on fishing, has spent countless hours perfecting the art of catching Pompano. 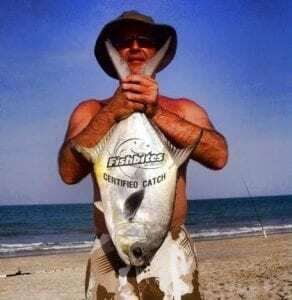 He has perfected what he calls the King Pompano rigs, which are sold all over South Florida. He has mastered the hook size, a pink poly tubing that covers the shank protecting against mackerel bite offs, he adds a jingle at the top, and then adds a piece of Fishbites scented bait. “It’s a triple threat – it’s visual, it makes a noise and the scent spreads drawing them in, you can’t miss” he says. “The rigs I use have three or two hooks. I prefer two hooks because you want to throw you bait as far as possible. The bigger Pompanos are in the deeper waters. Having only two hooks allow you to throw farther, it’s all strategy”. “Fishbites made this artificial bait with the color of the sand flea’s eggs, so you put it in the hook and when the hook touches the water it spreads the sand fly’s odor and that’s when the pompano comes smell the sand fly, sees its color and it comes to attack and plakata!! To get your own King Pompano Rig, handmade my Manuel Briceno, call 954-384-9107, and/or email manuelbriceno@bellsouth.net. Here is the video in both English and Spanish! Enjoy!